While growing up on the family dairy farm in Wisconsin, David grew fascinated with the wild pigeons that would take up residence in the barns. At the age of six he would aquire his first racers as pets, a hobby that went for over 20 years before he began to compete in local races. After seven winless years in Wisconsin, followed by another four in Florida, he decided that enough was enough, and that it was time to invest in some foundation birds. After aquiring some Houben bloodline in 1991and breeding youngbirds, he won six out of ten races in 1992. And so it began. In 1993 he had his first hall of fame bird. 1994 brought number one National Champion "Anna Marie". 1995 brought the beginning of his presence in the world of one loft money races, winning six of the nine he entered, bringing in over $94,000 in prize money for the year. In 1996 David was invited to race the Belgium one loft race where his bloodlines were really getting some atention amongst the top fanciers around the world. 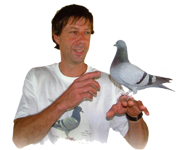 He partnered with the Houben family in the first "Sun City Million Dollar Pigeon Race" where the team came in with the second position honors. In 1998 David scored ACE bird in the Million Dollar Race and continued to hone the bloodline and compete in these money races around the world, primarily focusing on the one loft races as he believes that this is the most fair way to test the genetics on the birds. Over the next few years, more genetical testing and honing led to a third prize in the Million Dollar Race against the best in the world. The following year, 2003, the top honor of the pigeon sport at the time was accomplished. Never Say Die" took the top position, winning the Million Dollar Race in South Africa. After honing this magnificent bloodline David was able to cut the number of breeders down and focus on the most special avian athletes. An example of the quality and consistency that were formed is "Dana" a breeder whose grandchildren won over $295,000 in a thirteen month span around 2002, not a bad foundation to build the bloodline around.